ISAP (International Society for Asphalt Pavements) is a volunteer organization of professionals and experts established to share the latest in leading edge asphalt pavement technology worldwide. The Society's distinctly global and inclusive approach is reflected by the international membership, representing all stakeholders in the asphalt industry - users, producers, professionals, as well as individuals and organizations. ISAP is one of the most prestigious international organizations to promote asphalt pavement technologies. 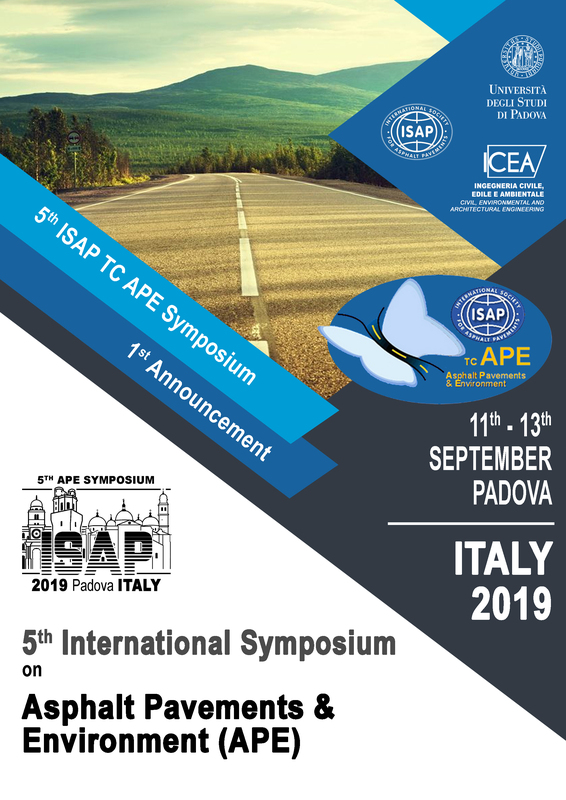 The Technical Committee on Asphalt Pavements and Environment (APE) is one of the TCs in ISAP and hosts the 5th ISAP APE Symposium 2019, together with the University of Padova (Padua, Italy). The APE Symposium has already been organized four times, in: Zurich, Switzerland (2008); Fortaleza, Brazil (2012); Sun City, South Africa (2015); Tokyo, Japan (2017). The 5th Symposium will be held in Padova (Padua, Italy). The Symposium 2019 will provide an excellent chance to share and disseminate research experiences concerning materials and technologies for asphalt pavements, conceived with the purposes of sustainability purposes and environmental compatibility.